For over 30 years Eagle Pack has made your furry friends health well being their number one priority! With the right combination of high-quality, fresh proteins, fats, carbs, antioxidants, and omega fatty acids, good health comes easy. 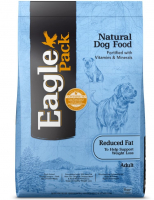 Eagle Pack has provided dogs and cats with quality, natural nutrition without fillers or artificial preservatives. With protein as the first ingredient in every recipe, pet parents can trust the Eagle Pack commitment to keep their dogs and cats healthy and happy. Their innovative formulas have been continuously researched with trainers and vets since 1985 to ensure they naturally fuel your pet’s daily adventures, both big and small.